After a successful test run last month, ReverseVision plans to expand in-person reverse mortgage training courses at its San Diego headquarters. The Home Equity Conversion Mortgage software and technology firm has hosted its online “RV University” program for the last three years, but decided to enter the world of in-real-life training in March with a course for 11 students. Starting in May, Reverse Vision will host the three-day event once per month, with scheduled events for May 2 through May 4, and June 6 through June 8. The format mirrors that of the online version, with a day each for covering regulatory guidelines, origination scenarios, and compliance and sales strategies for pitching the loans to a variety of borrower types or potential referral sources. In a statement, ReverseVision’s vice president of sales and marketing Wendy Peel pointed to the implementation of rule changes over the past few years as a key reason why players in the space should consider education courses. “Key regulatory changes have evolved the HECM significantly, which is why both new and experienced reverse mortgage professionals stand to benefit from hands-on training that addresses product knowledge,” Peel said in the statement. 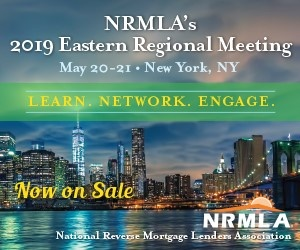 “Normalizing this product so that more traditional lenders see HECMs as a natural addition to their product offerings will be key to our industry’s continued growth and success,” Peel said. The courses cost $995 apiece, as compared to about $50 for the firm’s “Reverse Mortgage Essentials” course offered at all times online. The first round of the course in March featured both reverse mortgage brokers seeking a refresher on regulatory issues and other information pertinent to the HECM program, as well as forward-mortgage professionals looking to learn more about the product; ReverseVision is positioning the courses as a way to help home-loan originators and brokers generally expand their businesses.